alaTest on kerännyt ja analysoinut 22105 arvostelut tuotteelle Sony PlayStation 4 Pro. Keskimääräinen antama arvosana tälle tuotteelle on 4.3/5, verrattuna keskimääräiseen arvosanaan 4.3/5 kategoriassa Pelikonsolit. Me analysoimme käyttäjien ja ammattilaisten antamia arvosteluita, tuotteen ikää ja muita seikkoja. 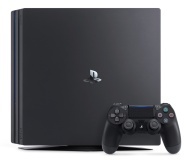 Verraten muihin tuotteisiin kategoriassa Pelikonsolit, Sony PlayStation 4 Pro on saanut alaScore™-arvosanan 98/100 = Paras. Sony PS4 Pro review: In light of the Xbox One X, we've taking another look at Sony's flagship console. Is it still worth a buy? The PS4 Pro is the undisputed console champ no longer, but if you’re looking for a step up into 4K gaming, it’s still the best deal in town. The PlayStation 4 Pro plays games at a resolution you'd normally expect out of a PC, and comes with the same technical challenges. The PlayStation 4 Pro is the most powerful home console yet, though you'll need a 4K/HDR TV to truly take advantage of it. If you already have a PS4 and are stuck with a 1080p, you can wait before upgrade. Best graphical performance in a console. ; Your existing games will get upgraded for free. ; Makes PS VR much smoother. Not a huge upgrade for existing PS4 owners with 1080p TVs. ; No 4K Blu-ray drive. ; You’ll have to wait for games to get patched to take advantage of it. Sleeker, faster and more flexible than ever, Sony's PlayStation 4 turns out to be a formidable force in the living room. Sony's slimmed-down PS4 is mostly the same old black box we've known since 2013. And that's OK. The newer PS4 has a smaller footprint, slick design, quieter operation and keeps intact all of the PS4 awesomeness it's offered since 2013. The slightly updated DualShock4 controller is a bonus. The slim PS4 loses its optical audio port, which will be a bummer for third-party headphone users. The somewhat pricier PS4 Pro delivers a larger hard drive and the promise of better graphics. The PlayStation 4 Pro promises enhanced 4K visuals for certain games. But at launch, it's a tough sell. The PS4 Pro outputs a 4K- and HDR signal that's compatible with high-end TVs, and promises better visuals and increased frame rates for certain games. The console includes a 1TB hard drive, and it works with all PS4 games, apps and accessories to date. Is $399 for 4K gaming too good to be true?